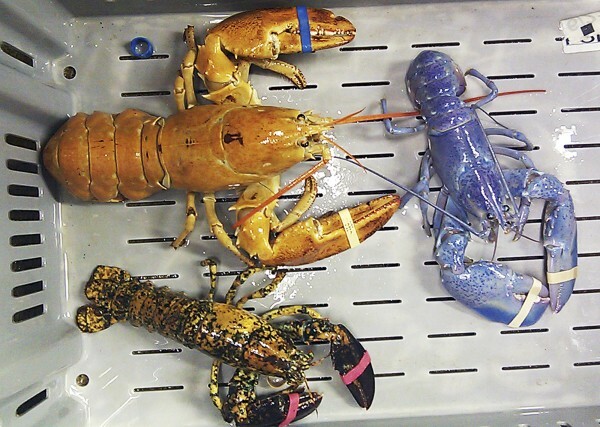 Another rare blue lobster caught in Mass. This photo provided by Rebecca McAleney shows a bright orange, left, a bright blue, right, and a calico lobster at New Meadows Lobster in Portland, Maine, Tuesday, June 26, 2012. BEVERLY, Mass. — Mike Malewicki didn’t know he had a such a rare catch when he hauled in his lobster trap 12 miles offshore earlier this week. But there it was, crawling among the usual load of brown and green crustaceans — a cobalt blue lobster. How rare is a blue lobster? Rare enough that Malewicki’s will soon go on display at the New England Aquarium in Boston. The Aquarium has agreed to take the lobster and exhibit it along with the other two blue lobsters in its collection. “He’s going to be seen by millions of people,” Aquarium spokesman Tony LaCasse said. LaCasse said lobster scientists estimate that only one in about 5 million lobsters is blue, although that number might be revised downward after a number of recent reports of colored lobster finds. The Lobster Institute of Orono, Maine, puts the ratio of blue lobsters at one in 2 million. A blue lobster was found by a Rockport, Mass., lobsterman this summer; it was donated to Maritime Gloucester. Albino lobsters, which present with no color at all, are estimated to occur once in 100 million lobsters; several were found off Cape Ann this summer, including one freed by a reality TV star. Malewicki, who has been lobstering for 30 years, gave his blue lobster to Rowand’s Seafood Market in Beverly so it could put the shellfish on display for kids to see. Rowand’s called the Aquarium, which plans to pick up the lobster in a couple of days. In the meantime, Rowand’s manager Aly Dupont said people are welcome to come down to the store to see it. The lobster weighs 1.1 pounds and is about a foot and a half long. LaCasse said it’s not easy for colored lobsters to survive. Most lobsters are a green-brown color (before they’re cooked) so that they blend in at the bottom of the ocean and avoid predators, he said. All lobsters except white ones turn red when cooked. Like all animals that go to the Aquarium, the blue lobster will be quarantined for a month before it goes on exhibit, to make sure it has no diseases. Despite their rarity, blue lobsters aren’t worth a lot of money, according to LaCasse. “People generally don’t want to eat them,” he said.